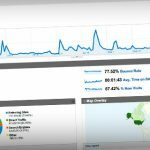 Many bloggers are adding an additional stream of traffic to their websites! The big advantage of PPC traffic is that you can buy traffic that is targeted and likely to convert. 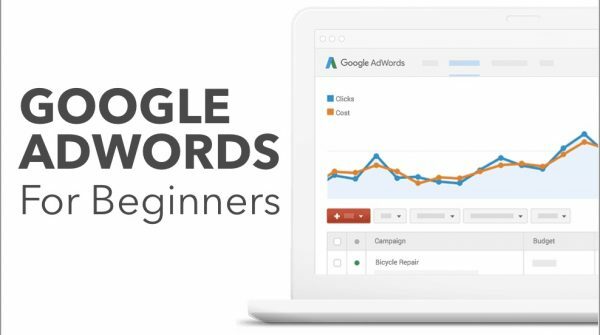 While this guide is aimed at Google AdWords beginners, we are including additional step by step links for experienced and inexperienced PPC advertisers at the end of this post. Anyone looking for outdoor furniture would be attracted to any one of these ads and click through to find out more. 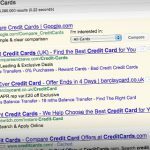 Since the ads are relevant to the search query, those clicks are likely to result in a conversion. It is claimed that businesses generate an average of $2 in revenue for every $1 spent on AdWords. 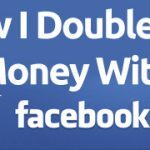 But while advertising on this platform can be incredibly lucrative, it can also be overwhelming for beginners given its learning curve. Simply diving in without putting any thought towards your account structure or keywords is a guaranteed way to burn through your budget with little to show for. Sadly, this is what we see happen a lot. Account structure cannot be emphasized enough. 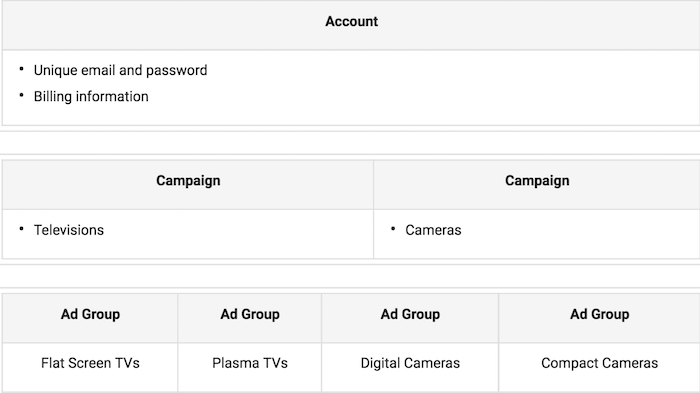 When you have multiple campaigns and ad groups running, you need a system in place to keep your efforts organized. 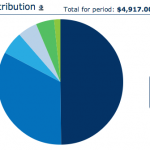 Another reason why a well organized account structure is important comes down to performance. 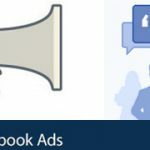 By creating a separate campaign with ad groups that contain tightly related keywords, you are able to display more relevant ads to your target market. This in turn leads to higher click through rates and more conversions. A common mistake that new advertisers make is having a single ad group. Setting up an account like this is problematic for obvious reasons as you would have to use a more generic ad. Imagine if you were searching for “men’s leather shoes” and you see these two ads in the search results. The headline on the first ad includes the exact query while the second ad is simply too generic. A well organized account structure lets you better manage your campaigns and create more targeted ads for each. Keyword research has a large impact on the success of your campaigns. The keywords you bid on trigger your ads whenever someone searches for those phrases. 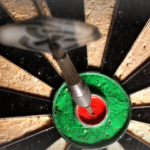 So you would want to target keywords that are related to your products or services. The challenge then is identifying those keywords that will drive traffic that converts. Start with your website first to identify the main categories to group your keywords around. Here is an example from a site that sells outdoor furniture. The keywords in red are a great starting point to create ad groups around. 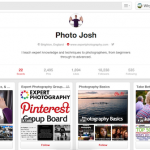 Organizing by theme helps to keep your campaigns organized and relevant. Jot down any keywords that are related to your products or services. 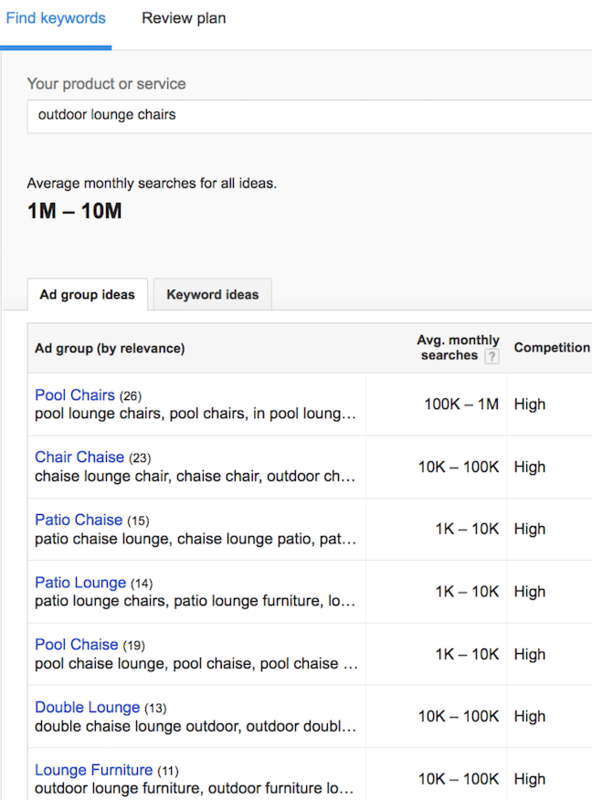 Google makes it easy to add keywords directly into your campaigns. 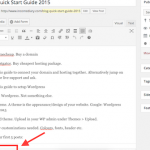 KeywordTool.io is another excellent tool to find keywords to target. 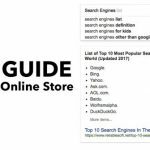 It even lets you easily search other search engines including YouTube, Bing, and even Amazon. Start small: Aim for quality rather than quantity. Only choose those keywords that are closely related to what your business offers. 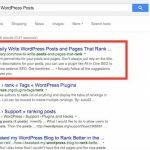 You can always add more keywords later on as you discover them. Don’t go too broad: A common mistake is to target keywords that are too broad. 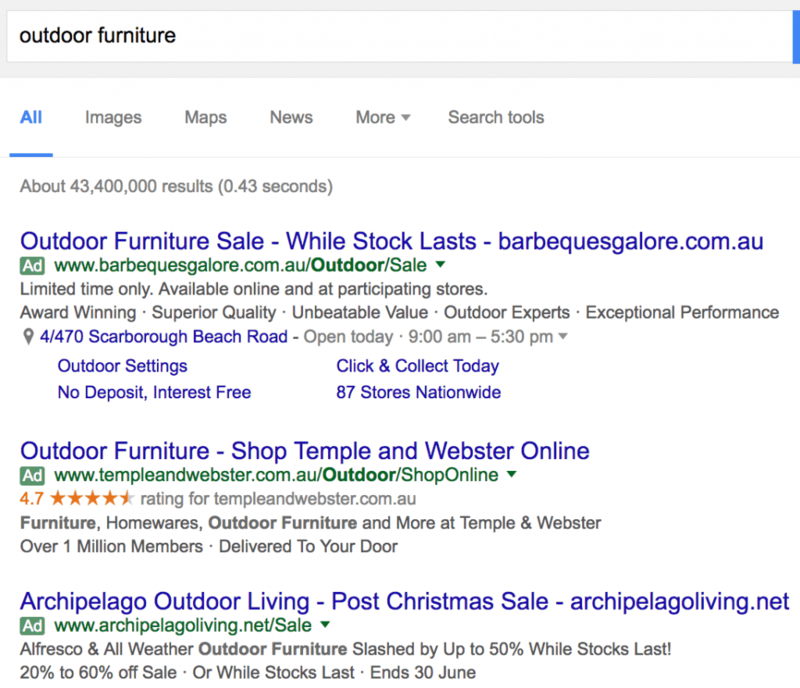 A keyword such as “furniture” likely generates a ton of traffic. But the keyword is too broad and not very targeted. You have no idea what the intent is behind that search. Don’t go too narrow: Similarly, you don’t want to target keywords that are too narrow either as they likely don’t generate much traffic. Aim for keywords that are at least a few keywords in length with decent search volume. Keyword research is an ongoing process. Some keywords will result in sales to your business while others will barely generate any results. You might also discover lucrative keywords in your own analytics data which you can add to a new campaign. You have an organized account structure based around your products. You have a list of potential keywords to your campaign. And you have compelling ads written for each ad group. So now it’s time to start advertising right? Just getting a visitor to see and click your ad is not enough. You need to convince them that your products or services are the solution to what they are looking for. The landing page is perhaps the most important then as this is where the conversion takes place. If someone is searching for outdoor lounge chairs but lands on a page about outdoor sofas, they are likely to hit the back button. But if they land on a page that closely matches their search query and also has a compelling offer, they are more likely to convert. If you are a business that requires a lot of background information (such as a financial institution) it will often be better to make that process – two step. For example, in step one, collect a name and email address (in return for example a free report) and then in your second step, follow up with a series of emails to persuade the ‘lead’ to take further action. You are likely to generate many more leads that way – but of course what really matters is how many of these leads end up taking the further action. For this reason, it is essential to always be testing your approach and trying to beat your CONTROL. It is not a given that a two step approach is best, but it most likely will be! 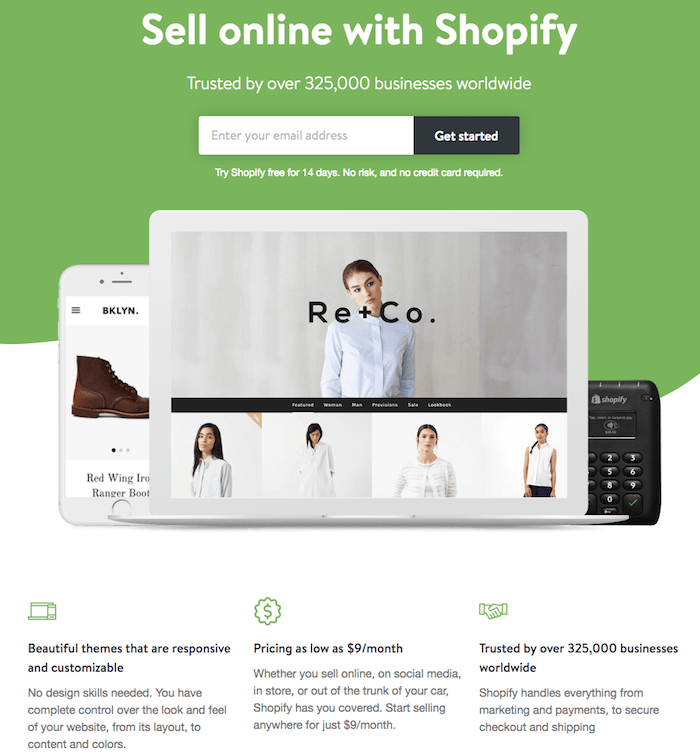 This landing page has a clear headline and offers several benefits for those looking to start their own online store. 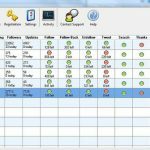 It is also incredibly easy to get started with a free trial. Keep clutter to a minimum: A cluttered design with too many elements on the page makes it difficult for visitors to make sense of anything. Keep the design simple and consider removing any distracting aspects such as navigation menus or sidebar widgets. Write clear copy: Copy is what ultimately sells your products or services. Your landing page has a greater chance of success if the headline is clearly written and in a way that offers a clear benefit to your target audience. A headline such as “Best Accounting Software” is simply too generic and not likely to convert well. Offer benefits: Turn technical features of your products into benefits that visitors can relate to. Use bullet points to make your message easy to read. Ask for minimal information: Asking for too much information right away can turn visitors away. 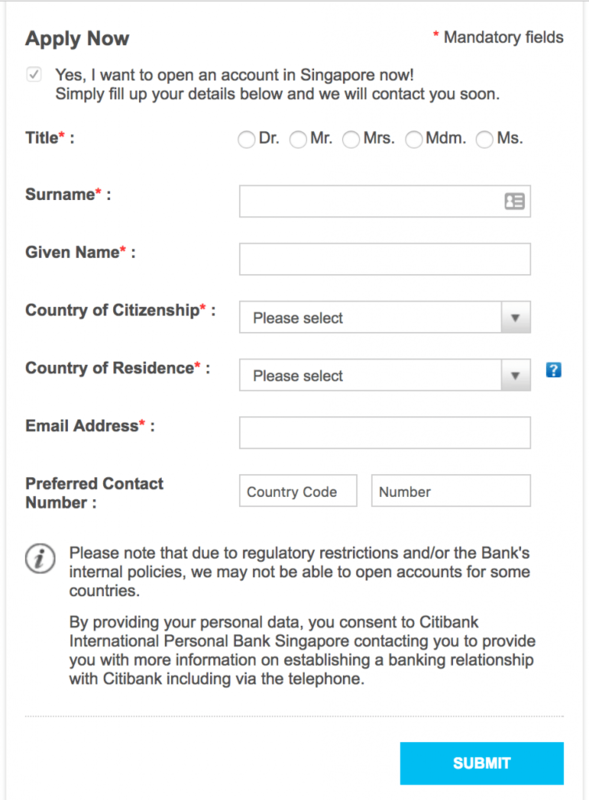 Keep any forms on your landing page to a minimum and only ask for enough information to get started with an account such as a full name and email address. Instead of simply directing visitors to your homepage, create targeted landing pages for each ad group. It requires more effort but taking this approach makes your campaigns more relevant. Depending on where you live, Google often offers incentives for first time users. Below is one such offer available in the UK. 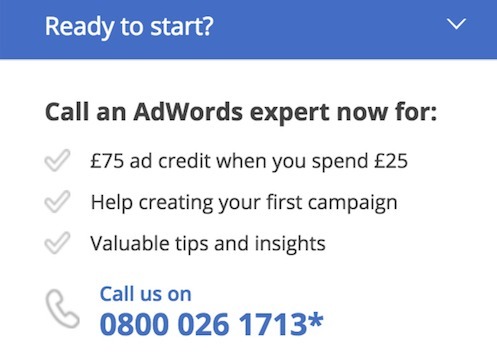 There are also AdWords Specialists available to help with getting your first Adwords campaign of the ground. That said, we would however suggest that for most entrepreneurs this is something you will eventually wish to outsource to a PPC Agency, especially if you are spending a lot of money. 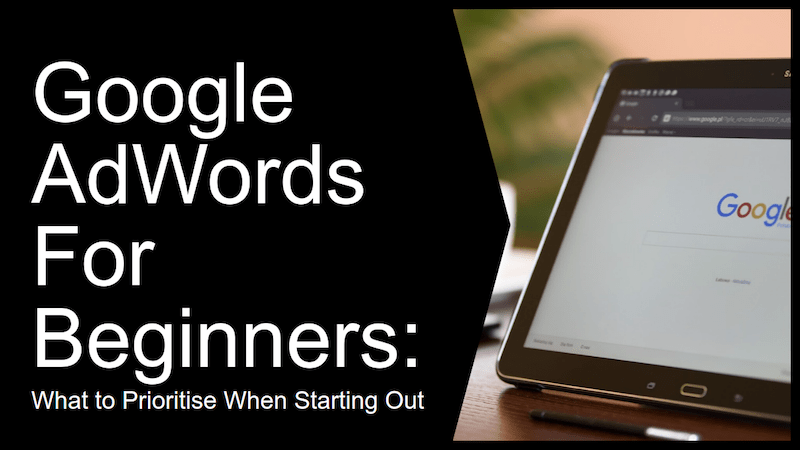 Getting started with AdWords can be overwhelming, especially for new advertisers as there is a slight learning curve. When creating an account, put some thought into the account structure as having a system in place will help keep your efforts organized. Identifying keywords to target and building out targeted landing pages are also important areas to prioritize when developing a Google AdWords strategy. Doing that now, will save a lot of wasted money later. 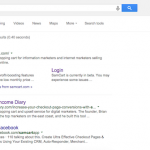 Want Information On Google Adwords? This article is meant to serve as a guide of sorts on how to prioritize for best results when you’re just getting started with google adwords. For a more detailed explanation on how to maximize your return on ad spend from Google Adwords, take a look at this Google Adwords mastery guide which covers the basics of setting up campaigns, choosing a strategy and getting profitable. Author Bio: Emily Reiffer is content marketer and Manager at Digital Monopoly – parent company of Paid traffic.